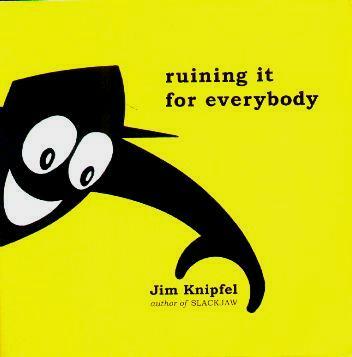 Jim Knipfel's memoirs (the third in a series) is full of his dark humor and quite eye-opening. Reading about his horrible and troublesome behavior, as a kid and a young man, gives us more than a clue as to how disturbed his young life was. Like when he and a friend tried to burn down a school building and got away with it. He claims to not like the spirituality aspect of people, and in this book, tries to come to grips with the whole idea. His work is easy to read, if not a little unnerving, and gives one an insight into the mind of one racked with insecurities. He started having seizures and his eyesight was deteriorating due to a disease called retinitis pigmentosa, a slow, degenerative eye disease. He recounts moving from Wisconsin to Philadelphia and how he ended up living in Brooklyn, New York, his failed marriage, a subsequent relationship, his jobs (and lack thereof), and what he got up to along the way. Growing up, bascially. Seeing the world for what it is helped him cope with his lot in life and his career as a journalist took off. He's written two other books, Slackjaw and Quitting the Nairobi Trio - the former about his failing body and the latter about his failing mind. Conclusion - Enjoyable and a little fascinating.